CORRECTION: An earlier version of this story incorrectly stated the housing was transitional in the headline, it is not. The YWCA plans permanent social housing for the future residents. The Public Record apologizes for the error. 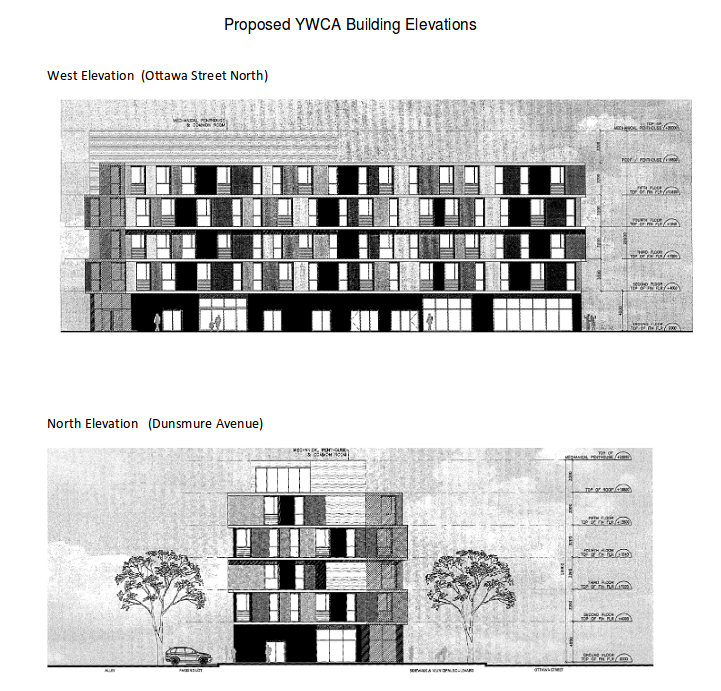 Hamilton City Council’s Planning Committee gave its approval Tuesday for YWCA’s plan to construct a new six-storey mixed use building with 50 affordable housing units to replace their present Ottawa Street location at 52 – 64 Ottawa Street North. Councillors were very supportive of the YWCA, with Ward 4 Councillor Sam Merulla in attendance to ensure approval. Merulla is not a member of Planning Committee. Letters submitted to Council from nearby residents were split between those opposed and those in favour. The opposition was focused on the planned 50 units of transitional housing that will include a mix of single, two, and three bedroom rooms. One neighbour was particularly fierce in her opposition, writing that the proposed the 50 units would house “undesirables” who would engage in drug use and cause havoc in the community. Concerns about height, noise, and traffic were expressed by a few neighbours. Three of the objectors sought for the City to designate the existing YWCA building as a heritage structure. Those in support spoke about their desire to see a new facility in their community, and the need for affordable housing in East Hamilton. City staff reviewed the requests for heritage designation, and determined there was not significant grounds for designation. The YWCA is planning to include features of the existing building in the new building. Planning staff took particular positive note to “inclusion of coloured panels which are intended to represent the historic fabric district of Ottawa Street North”. Ottawa Street is officially a “major arterial road”, and therefore planned for expansion to six lanes. The City’s roads plan states the six-lane capacity is needed to accommodate thousands of shift workers in jobs which no longer exist. The City’s road-widening plan required the YWCA to give the City 13 metres along Ottawa Street; which effectively prevents the building of any useful structure. The City waived the 13 metres, and instead is taking three metres. The new YWCA will be three metres further back from the front of the present building. Today’s approval enables the YWCA to submit applications to various affording housing funding streams from higher levels of government and private foundations. The YWCA expects to also engage in a public capital fundraising campaign. Timelines for the project will depend on the timing and success of major funding applications. No disabled housing mentioned. A ten year wait list in Hamilton. No Disabled apartment mentioned anywhere, currently a ten year wait list for a one bedroom. Seems to be off the table, still.